as receiver, translator, and illuminated believer. On the flip side of the symbol? An 'e' ... for ecstasy. ... Ecstatically grateful, crowned in glory ~ all by choice, temperament, and inner voice. possibility, mechanics and presence of an energetic ring, lightly toted above our earthly Being. As this logical mind feels satisfied, releasing control to higher guidance, an extension begins to make manifest the peace within - moving beyond fear, terror, anger or rage to embody Love as Light, with Gratitude present and in-sight! Oh! and consider this: Ecstasy is rooted in the Greek word, ekstasis, meaning to stand outside oneself, to feel your sense of self projected to a point outside that occupied by your body. Ecstatic Gratitude - Hellllloooo, Halo! ...In working with this method your attention is, again, on the heart, generating feelings of appreciation and gratitude. And as you sense ecstasy beginning to arise in your body, you shift your attention to the field around your body. This field of energy looks very much like a luminous egg when viewed clairvoyantly. ...There is a central line or axis that runs through the center of this field, and it happens to also run through the center of your physical body—through the top of the head and down through the perineum. This line is the central axis of the magnetic field that comprises the subtle energy body. This body, or field, extends above the head and below the feet a few inches, to a several feet, or even yards. In certain highly charged energy states, the axis and subtle energy body can expand much farther than that. I would like to talk with you about writing a monthly column on Gratitude in The Infinite Field Magazine. 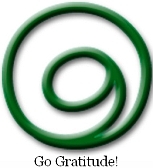 I have not seen anyone who talks about Gratitude and the Gratitude symbols the way that you do. I ran across your info. on Twitter. Hero - and he is such a person in a defining moment for the human society has made the need.Do you think so? I am so proud of the work you have done to help the global world to remember gratitude. It is almost certain you won't. Do you think so? Now that is balance talking. Very symbolical. Honestly, they symbol is very appropriate for its meaning. The ultimate in wireless security measures, shutting down your network will most certainly.